The Chemnitz Fossil Forest depicts one of the most completely preserved forest ecosystems in late Paleozoic Northern Hemisphere of tropical Pangaea. Fossil biota was preserved as a T0 taphocoenosis resulting from the instantaneous entombment by volcanic ashes of the Zeisigwald Tuff. The eruption depicts one of the late magmatic events of post-variscan rhyolitic volcanism in Central Europe. 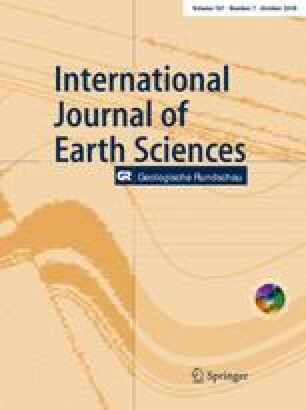 This study represents a multi-method evaluation of the pyroclastic ejecta encompassing sedimentological and (isotope) geochemical approaches to shed light on magmatic and volcanic processes, and their role in preserving the fossil assemblage. The Zeisigwald Tuff pyroclastics (ZTP) reveal a radiometric age of 291 ± 2 Ma, pointing to a late Sakmarian/early Artinskian (early Permian) stratigraphic position for the Chemnitz Fossil Forest. The initial eruption was of phreatomagmatic style producing deposits of cool, wet ashes, which deposited from pyroclastic fall out and density currents. Culmination of the eruption is reflected by massive hot and dry ignimbrites. Whole-rock geochemistry and zircon grain analysis show that pyroclastic deposits originated from a felsic, highly specialised magma, which underwent advanced fractionation, and is probably related to post-Carboniferous magmatism in the Western Erzgebirge. The ascending magma recycled old cadomic crust of the Saxo-thuringian zone, likely induced by a mantle-derived heat flow during a phase of post-variscan crustal delamination. Geochemical trends within the succession of the basal pyroclastic horizons reflect inverse zonation of the magma chamber and provide evidence for the continuous eruption and thus a simultaneous burial of the diverse ecosystem. The online version of this article ( https://doi.org/10.1007/s00531-018-1608-8) contains supplementary material, which is available to authorized users. We highly acknowledge manifold support by our excavation team, especially Ralph Kretzschmar, Volker Annacker, Mathias Merbitz for technical support and Thorid Zierold for dedicated project management. Further we are indebted to Marion Tichomirowa, Christoph Breitkreuz, Alexander Repstock, Klaus-Peter Stanek and Jörg W. Schneider, Freiberg, Sven Eulenberger and Bernd Tunger, Chemnitz and Frank Löcse, St. Egidien for fruitful scientific discussion. We are particularly grateful for financial support by the Deutsche Forschungsgemeinschaft (DFG grant RO 1273/3-1 to RR).